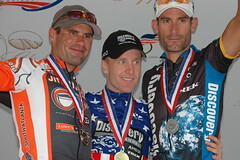 Today's the day for the 2008 US road race championship. This race course has been great at selecting the strongest riders, and has favored riders with ProTour-level experience. Garmin-Chipotle has brought all their big guns, so it's really their race to lose here. Another rider I was surprised to see skip the TT was Chris Baldwin, who won the open TT championship in 2005 and was 2nd in 2006. He and his Toyota-United teammates Chris Wherry and Justin England are looking for new teams, after their team management, still looking for a new team sponsor, freed the team to seek new employment in the meantime. They would really like to show off their talents here today. George Hincapie, Craig Lewis, and John Devine are here for Team Columbia. Rock Racing brings a big squad -- 8 riders -- including Tyler Hamilton and Fred Rodriguez. Many of the domestic squads are racing with nearly a full roster: Bissell's got 10 riders, including Asheville's Teddy King, Aaron Olson, and Ben Jacques-Maynes; BMC brought 7 riders, and their Jeff Louder is coming off a win at the Tour of Utah earlier this month. There's supposed to be live streaming video of the race starting at race time, 1 p.m. Eastern. That same page has the latest start list. I'll try to post some updates to my Twitter stream during the event -- look for photos later tonight. 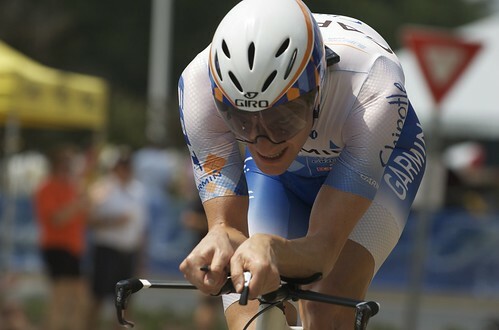 Dave Zabriskie was seen by many as a question mark coming into the race, but he took a 3rd consecutive US title at the USA Cycling Pro Time Trial Championship today. Zabriskie edged out Bissell's Tom Zirbel, with Garmin-Chipotle teammate Christian Vande Velde 3rd. Here's my time trial photoset. I'll probably add a few more photos over the next couple of days. 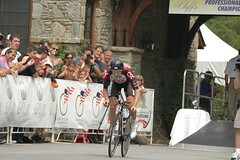 If you have photos of your own, please add them to Flickr's USA Cycling Championships pool.